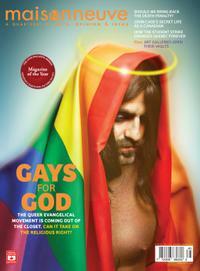 "They call themselves LGBT (lesbian, gay, bisexual and transgender) evangelicals. They are among the kindest, gentlest people I know. They are also among the most unwanted and unrecognized. But they are determined—and their numbers are growing,"
It is an axiom that monsters are a representation of the things we fear about ourselves or the fears we carry about others. One way we wrestle with our fears is through literature and film about monsters. Monster movies tend to reflect--in veiled form--what is causing anxiety in our culture (in that sense they are very similiar to the ancient Jewish genre of writing known as Apocalyptic, of which the Biblical Book of Revelation is an example). Some sociologists have postulated that the popularization of zombies as the "monster de jour" (beginning with Richard Matheson's amazing 1954 book I Am Legend--which bears little resemblance to the crappy Will Smith movie of the same name) can be directly correlated to American consumerism (zombies have an insatiable need to consume the living, and think of the absurd scenes in George Romero's Dawn of the Dead in which zombies wander aimlessly through a shopping mall as muzak plays in the background). Zombie apocalypses also depict our fear of societal collapse as the "others" threaten to take over. And, of course, there is the basic human terror of death (as well as aging--which is feared by some as a form degeneration or living decay). In recent years there have been been a spate of zombie films that have a decidedly satirical political subtext; where mindless zombie hordes represent conservatives. I wonder if this will be the subtext of Brad Pitt's new zombie movie, World War Z (or perhaps it will be immigration--another example of the "other" that we fear will overrun us). I rarely watch horror/monster/zombie movies anymore--I can't take the voyeurism and violence and gore, which have become extreme--but I am intrigued about the subtext of a film called Cold Body, Warm Heart in which zombies--motivated by love--begin to "cure" themselves and come back to life. I can't help but think that there is an underlying commentary here about the dissatisfaction with consumerism; an awareness of the isolation and alienation our entertainment culture has led us to; and our cultural movement towards accepting others who are different from us and who perhaps we previously thought of as monsters. Instead of people becoming zombies, the zombies are becoming people--no longer to be feared. Are we a divided nation? That certainly is the impression you get from the cable news outlets. They display maps of the U.S. comprised of clusters of "red states" and "blue states". The statistics of the popular vote in the Presidential election seem to support this notion of a divided country, with 50% voting for Obama and 48% voting for Romney. 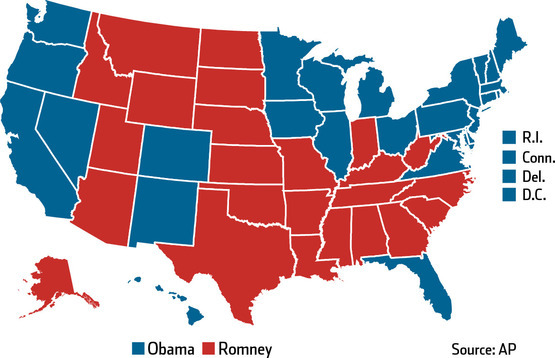 TV, radio and Internet pundits will express that "half of America" voted for Obama and "almost half" voted for Romney. But is that really true? I don't think so. To begin with, the "half" that voted for Obama and the "almost half" that voted for Romney do not make up the "whole" of the United States. The total population of the United States is approximately 315 million. The number of people who voted is approximately 119 million. In other words, about 38% of the population voted. That means the 50% percent who voted for Obama are only about 19% of the population of the country (and slightly less for the percentage that voted for Romney). But how many of those voters are truly "red" or "blue"? According to Gallup, 40% of Americans identify as Independents, 31% as Democrats and 27% as Republicans. If we assume that those percentages match the makeup of actual voters, then it would mean that about 97 million registered Democrats voted, 85 million Republicans voted and a whopping 126 million Independents voted. These numbers are all very fuzzy--I'm no Nate Silver by any stretch--but the point is that those who are truly "blue" or "red" are a minority within a minority. American culture tends to think in dualistic, binary terms and so we naturally gravitate to the "Red state vs. Blue state" narrative. But in reality, many things exist along a continuum rather than at opposing poles--especially when it comes to things that distinguish one person from another. The fact that 57% of the electorate in Texas voted for Romney does not make Texas a "red" state, anymore than 54% of Oregon voters choosing Obama makes it a "blue" state. Of that 57% in Texas and that 54% in Oregon, how many voted a straight partisan ticket and how many voted for multiple parties, say a Democratic President and a Republican Senator (or vice-versa)? How many who voted for Romney in Colorado also voted to legalize Marijuana? How many who voted for Obama in Washington state also voted against gay marriage? People, and their political/social/moral views, are complex. The bichromatic map is a ridiculous oversimplification. Those who see the United States as a divided nation are, I would suggest, those who themselves are at one extreme of the spectrum and assume that those who don't share their perspective must be at the other extreme. They see polarity because they themselves are polarized. But I believe the truth is that the American populace--the 38% who voted and the 62% who didn't--are spead out all across the spectrum on any given political issue or position--from Strongly Agree to Somewhat Agree to Neutral to Somewhat Disagree to Strongly Disagree (and all the gradients in between). Two people who strongly agree with each other on one issue may strongly disagree with each other on another issue. And they can still be friends. The "divided nation" story is a myth. The truth is that we all have much more in common than we do in contrast. This is beautiful. Unity without uniformity. Community without conformity. On September 29, 2012 the Christian Church (Disciples of Christ) in Indiana voted on a resolution pertaining to Sexual Orientation with Regard to Ordination, Commissioning and Licensing of Ministers. Prior to the debate and voting on the resolution, two pastors with opposing views addressed the assembly. "I think God is calling you to understand this as an issue of justice." "To a lot of people across this great nation, what's happening out here this afternoon is a total nightmare. I'm here to tell you it is no nightmare. It is God's dream, coming true before your very eyes." Bishop Gene Robinson's Sermon on Gay Pride Day from Auburn Seminary on Vimeo. Many people are glad to stay in their seats with the windows closed. They they can say, 'I've visited the Holy Land,' without having risked anything. 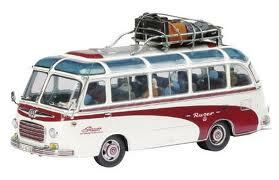 Now, there's a certain logic in taking a tour bus the first time you go to the Holy Land. But some people want to go back again by themselves, having learned the language. They want to walk around on their own, live with a local family, get engaged with the community, and immerse themselves in what they saw out the window. For them it's not enough to stay on the bus for the rest of their lives. The question for the churches is 'Do we want to keep running tours of the Holy Land? 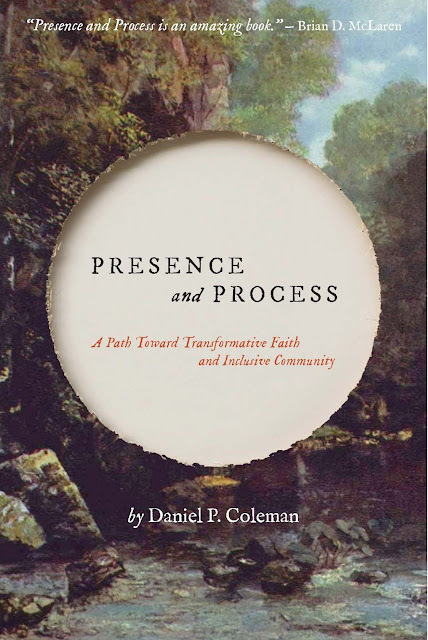 Or do we want people to go there on foot, explore the landscape of faith for themselves, and find out where they might engage the needs of the world most fruitfully?' Serious seekers want churches that will support them in a lifeliong exploration of faith and action, and help them keep sorting and sifting what they're learning."